The last day of a four-day weekend turned out pretty nice — not too cold, not too rainy, not windy at all. 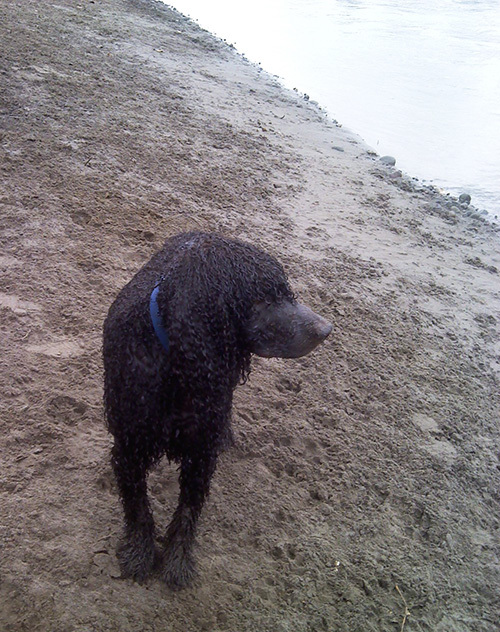 Turned out to be a perfect day to go out to the Delta with Cooper. Some years ago, I bought a crate mat at a dog show. I love that crate mat. It’s the one mat that Cooper didn’t chew, it’s washable, it’s sturdy, and it looks pretty good. It’s quilted, but not too thick, and relatively flat, and rectangular, with fleece on one side, denim on the other side, and some sort of thin batting in the middle. This one guy sells them, or used to sell them anyway, at dog shows in the Pacific Northwest. And for the last year, I’ve been looking for this guy and his mats at every dog show I went to. So, here I was, bored, with just a little money, a worn-out round dog bed (not the same thing as the mat), and a desire to have a mat like the one I’ve been looking for. How hard could it be to just make one? And my last sewing project was a camo holding blind, also for the dogs. So what the heck? I took apart the dog bed and saved the covering material that was still in good shape. After taking some measurements, I went out and bought some golden brown fleece and batting, all on sale. I did a little research on the Internet about how to sew two pieces of material with batting between them. 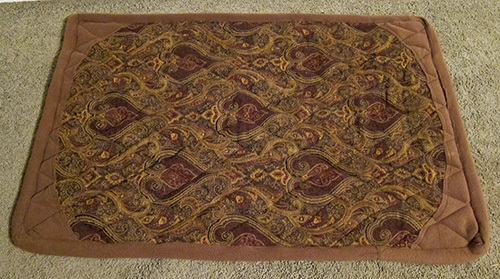 Plus, I have a sewing machine in good working order, and I can cut out material to size and even sew a straight seam. Even so, it was harder (and more time-consuming) than I thought. I didn’t really realize that when you quilt material, the quilting seams draw the material in, so that the finished size is smaller than what you’ve cut out. I didn’t realize quite how many quilting seams I was going to have to sew. And I didn’t quite get that the layers of material can move around, even when you use a lot of pins and sew out from the middle as instructed. But 8 long hours later, it didn’t turn out half bad. It’s not quite as stiff as I’d like, and it’s a little thicker than the original mat. And since the finished dimension turned smaller than I anticipated, I had to add an edge of pieced-together material around the outside. But Cooper uses it, it lies flat on the floor, and I got to recycle the old worn-out bed. So I guess I’m happy. “This is her transition from pigeons to ducks. The training table at Parkdale Kennels is 16′ long, about 2′ wide, and table height off the ground. It includes a wire tether that goes along and above the length and is attached to the dog’s collar. The table provides just enough room for a dog to walk down the length, pick up one or more objects, turn around, and come back. That keeps the dog’s mind focused on the task at paw (so to speak) — there is some freedom of movement, but not enough space to run off. The fact that Tooey is on ducks now is wonderful. Just yesterday, she started on pigeons. And, I’m pretty sure this is the first duck that she’s picked up without having first gotten to jump into the water. Tooey will do anything to get into the water, even bring back a duck. And she’s done that several times. (This previous post includes pictures of the last time.) So for Butch to get her to pick up a duck without that incentive is a very good sign. This Thanksgiving morning started with sleeping in an extra hour, a nice coffee and omelet breakfast, and phone calls with some family members. 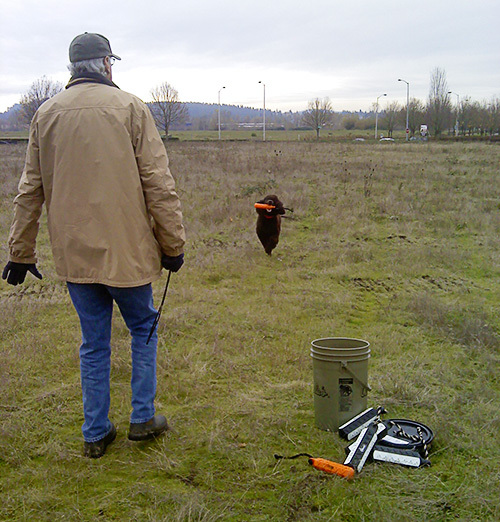 Then Russ, Cooper and I drove out to one of our favorite local fields to do a little field training. It’s a nice field with a variety of cover, from dead flat, to medium grass, patches of nettle and blackberry, small shrubs, and the occasional pieces of trash for distraction. And it’s close — just about 15 minutes away. Oh, and one last thing to be thankful for — we got to use the field today. 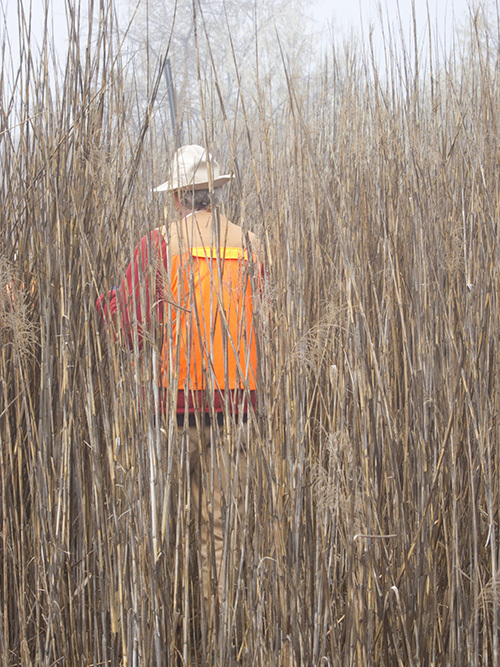 When we got there, we found all kinds of construction equipment and a construction trailer. Looks like it’ll be an office or store, with a parking lot soon. Because today is Thanksgiving, the construction crew was off, and the equipment was quiet. Today was probably our last opportunity, so we were glad to take full advantage. 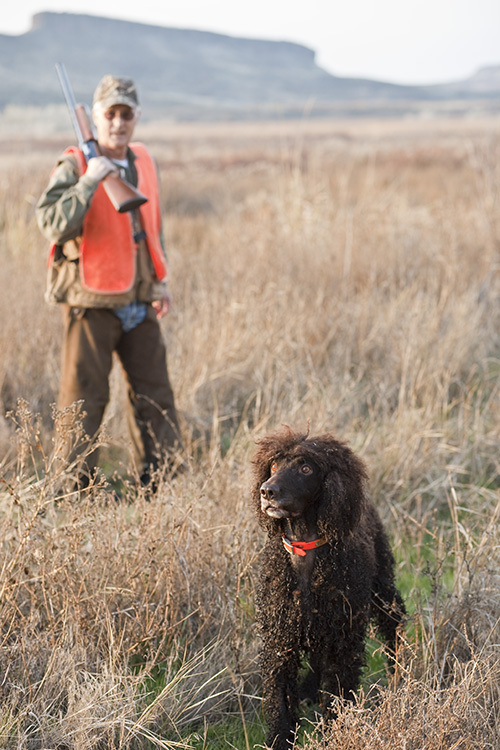 The prime photo would have been a triumphant portrait of the mighty hunter and his dog, with birds. 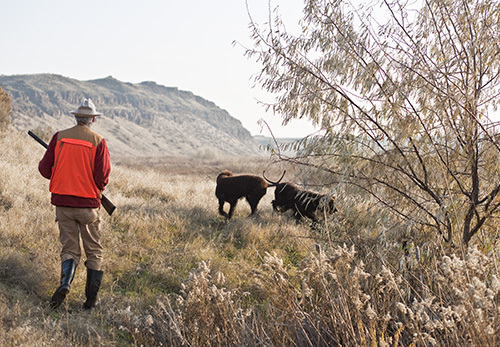 Having not gotten any birds during this month’s hunting trip, though, we will settle for photos of hiking with shotguns and dogs. 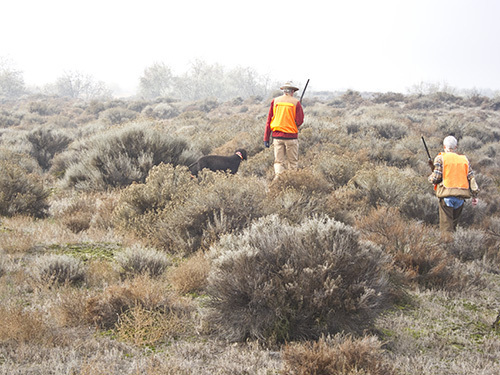 You can see the varied terrain: everything from sage brush, tall grass, cattails, worn deer paths, ponds, and etc., plus the variety of weather from dense fog to lightly clouded skies. 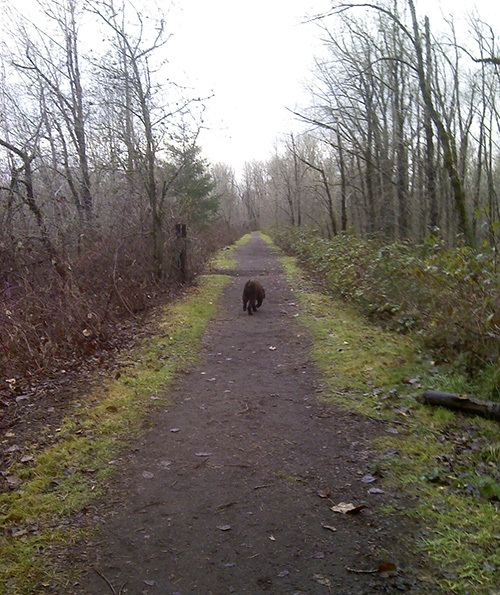 Nice hiking temperature, no rain — the only thing keeping it from being perfect was the lackage of birds. 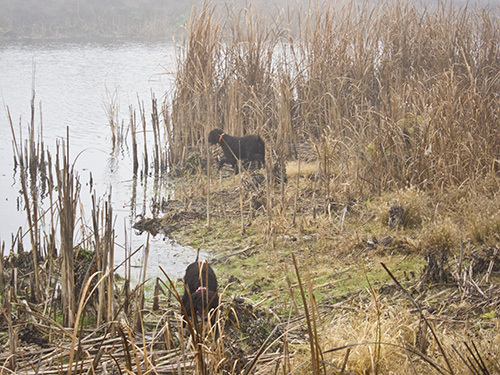 Just prior to Cooper's retrieving a weeks-dead duck. Good "leave it!" When you write a blog, it’s always nice to have the photos right away, on or near the day events occurred. But with official dog show pictures, this is usually not possible. You have to wait until the show photographer has the time to print and send the photos to you. 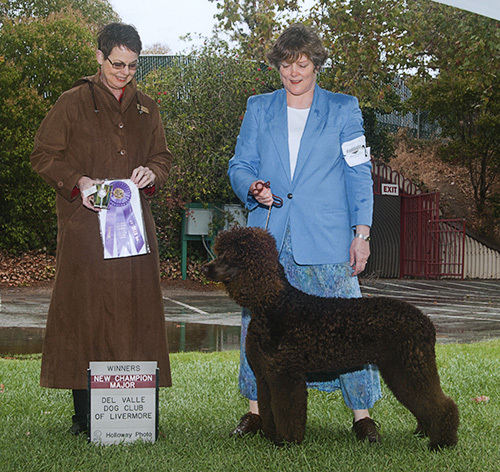 So, just the other day I finally got the official show pictures from our lucky day at the Del Valle dog show, back on October 24. The judge holds the trophies and/or ribbons. 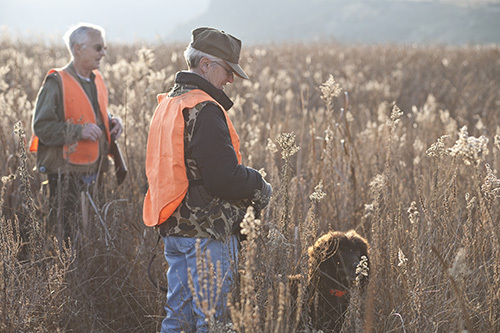 The handler stands next to the judge and holds the dog. 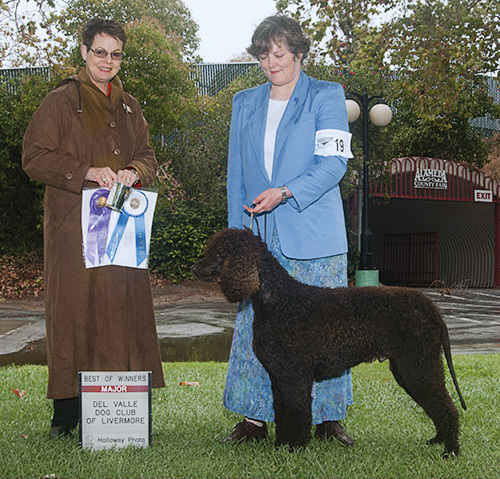 Both the judge and the handler ideally look at the dog, not the camera. There is a placard that shows the show name, what placement the dog won, whether it’s a major win, and the title earned, if any. Usually the photographer’s name is on there, too, and often a date. In these pictures, you can also get a hint of how wet it was outside — see the rain water on my shoulders? and the judges’ raincoat? Since Tooey went to Parkdale Kennels for retriever training, I’ve been able to talk to the trainer every week about how she’s doing. I’m very happy to say that Tooey is doing well. She spent the first week learning to work indoors: sit and whistle-sit (sitting when the handler whistles once), heeling on leash, and a trained retrieve of bumpers while she’s tethered to a post. The second week, she was no longer tethered to the post during the training sessions. 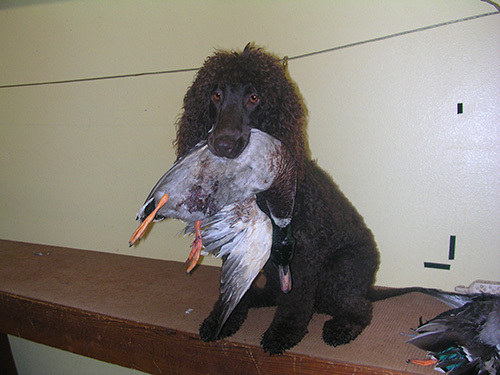 Instead, she moved on to trained retrieve and deliver to hand on a 16-foot training table. This means that she has the opportunity to retrieve more than one bumper (and also has more opportunity to misbehave!). She also kept working on whistle-sit and heeling indoors. This week it was planned that she’d go outdoors to do the same things, and maybe get a bird, but I’ll hear more about that on Friday. Since it’s been below freezing a lot this week, the plan may have changed. 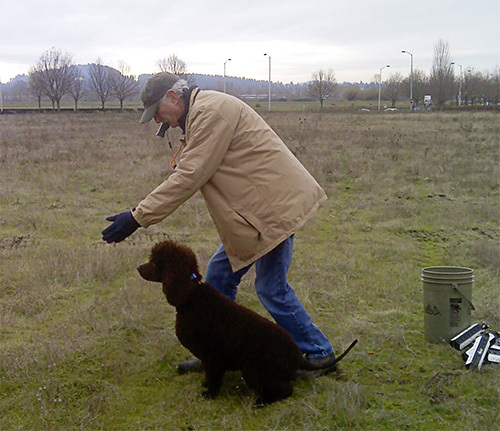 Tooey and Butch (her trainer) had one disagreement during her second week, and he had to insist, using the e-collar at its lowest setting, that she comply with his instructions to fetch. Apparently, she reacted (as he’d hoped) by figuring out that she avoids pressue and gets rewarded for complying. She also had one session where she pretended not to know what he was talking about (oh, I recognize that maneuver! ), and he had to insist once again. If she hadn’t tried to pull this right after she’d done it several times correctly, then he may not have have been sure that she was pretending. Silly girl. Butch is very happy with her progress. I wish I could see for myself, but I just have to wait. I’ll check in again this coming Friday.